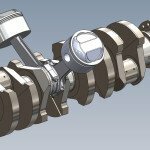 If a fluid is considered incompressible how does any hydraulic system create pressure? 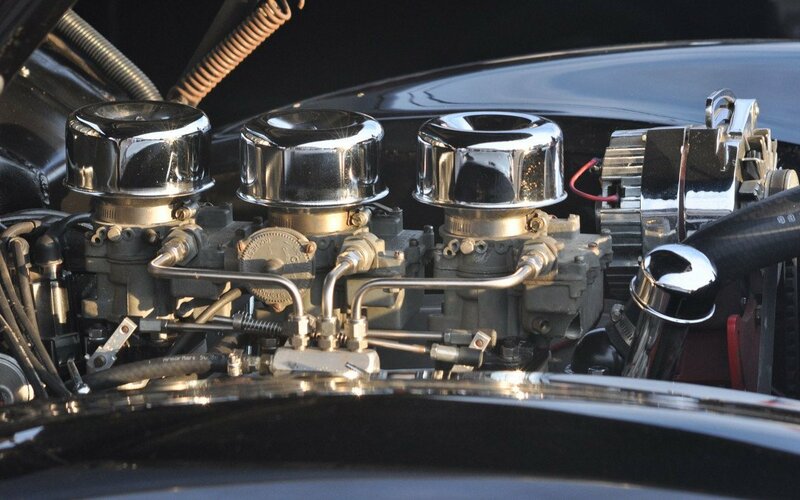 An engine’s oiling system bows to many laws of hydraulics even though the oil is not considered a working fluid. An example of a working fluid is brake fluid, which is used to perform the task of forcing brake pistons against brake discs to retard the motion of a vehicle. Pressure is created in a hydraulic system by limiting or restricting flow. The simple garden hose is the best teacher of this theory. A hose without a nozzle has a high rate of volume pass through it but with negligible pressure. When the nozzle is attached the discharge pressure increases but the rate of flow decreases. The nozzle is a restrictor that varies in orifice size. Thus, a restriction is needed to increase pressure. In a hydraulic system the pressure and flow are inversely connected. 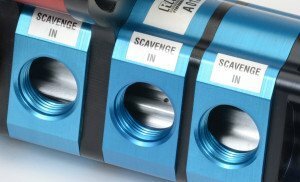 System pressure in an engine is used for a number of things: it pushes the oil through the intricate passages so all of the parts can be lubricated. It also creates an oil film between the crankshaft journal and the bearing that prevents the two parts from touching. The oil allows an engine to keep running, avoiding the catastrophe of seizure. Reading the engine oil pressure on a gauge is the cumulative effect of the bearing clearances (both rod and main), the viscosity (thickness of the oil), the length, diameter and surface finish of the oil passages referred to as galleries, along with the output of the pump and the speed of the engine. 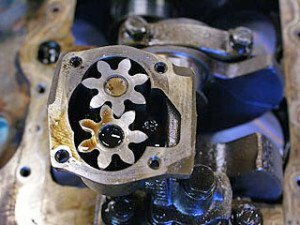 The oil pump is responsible for moving the oil through the engine but is only one determining factor. Most engines employ one of two oil pump designs: a gear-type or a rotor-type. The gear-type comprises the pump body and two gears meshed together inside. When one of these gears is driven and rotates, the other gear rotates in the opposite direction. Oil is carried around the outside of each gear and forced into the space between the gear teeth and the body, thus producing pressure at the outlet. In the rotor-type pump, which is also technically referred to as a trochoid design, the drive rotor and the driven rotor are meshed together inside the pump body. The drive rotor shaft is made eccentric in relation to the body so when the drive rotor turns, the driven rotor also turns but the space between the rotors changes. Oil enters from the inlet port where the space between the rotors is large and is sent to the other side where the space is smaller. This diminishing space causes pressure to be developed and oil to be forced through the outlet port. The rotor-type pump has the same effectiveness as the gear-type pump but has the advantage of being smaller. Oil pumps are classified as positive displacement pumps. 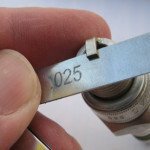 This means that maximum pressure is limited by the introduction of a pressure-relief valve. If a pressure relief valve were not used, system pressure would become dangerously high. 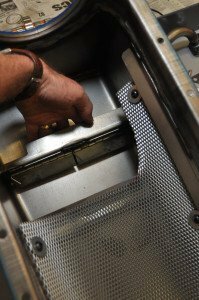 Every oil pan and pump manufacturer has a specification for the distance the pick-up is installed above the floor of the pan. The oil pressure relief valve consists of a valve or ball and coil spring. Oil drawn in from the strainer is delivered to the oil filter. The relief valve opens as delivery pressure rises in relation to engine rpm. Oil will then be bypassed from the pump’s outlet side into its inlet side to maintain a specified pressure. By the use of an exact tension spring on the relief valve, maximum pump pressure is established. However it will not increase the volume of oil a pump can deliver. A minimum industry standard for oil pressure is 10psi for every 1,000rpm. For example, an engine that idles about 700rpm needs a minimum pressure of 7psi and that should increase as engine speed rises. Thus, at 4,000rpm the engine requires a minimum of 40psi oil pressure. The chief constraint in using this simple formula is that the viscosity of the oil, the horsepower of the engine, or the bearing clearance are not considered. The 10psi /1,000rpm specification is a general rule and is used for diagnostic purposes on production vehicles. If a new or in-service engine meets this standard then there is no basis for a warranty claim or a repair regardless of what the customer asserts. When an engine is modified the cylinder pressure (and horsepower) is increased and in turn, the oil film needs to be maintained under the higher load placed on the bearings—exacerbating the oil bleed around both sides of the bearings. 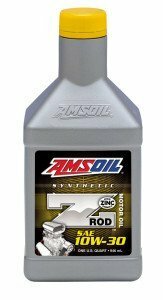 As a solution many enthusiasts switch to thicker oil, which ends up costing horsepower while offering no improvement to the oil film. Also, it must be recognized that it takes power to drive an oil pump, which is considered a parasitic loss inside the engine. A pump that is delivering 80psi takes more power to run than one creating 40psi. Owners, naturally, take delight in observing the pleasing sight of the needle on the right-side of the gauge, though this perception is slightly flawed. To effectively lubricate an engine it is more desirable to have just enough pressure while accompanied by a high flow of oil. This is referred to as a high-volume oiling system not a high-pressure system. Designed for Muscle cars form late 1960s to 70s. 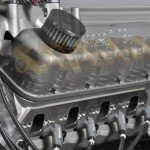 The oil in an engine is also used as a coolant and the greater the volume that is pumped through it, the more heat that can be removed from critical engine parts. 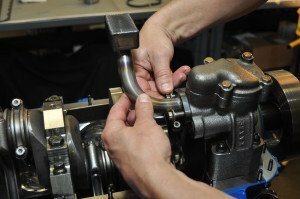 When building or modifying an engine you need to consider the oiling system pressure as the cumulative result of the bearing clearances, the weight of oil employed, the true potential horsepower and rpm, and the design of the oil pump. Then you tune the system to the desired pressure with relief-valve adjustment. Most people give little or no consideration to all the other factors and, instead, are engrossed in altering the relief-valve settings to achieve the desired reading on a gauge, not realizing this is a misguided approach. If you bought your car from someone who had the engine rebuilt producing no more than an extra 100hp from stock and you’re unaware of its bearing clearance, you can adjust the pump to deliver 15psi at idle with SAE 10W-30 oil. If you follow that curve the engine should record 45 to 50 psi at 4,000rpm. Of course, if it is completely stock and it can maintain the 10psi /1,000rpm criteria there are no concerns. But keep in mind that if the bearings are worn then the engine will require a higher pump output to maintain a nominal oil pressure. When engines were easier to work on, the less ethical were tempted to install a stiffer spring in the oil pump to mask worn engine bearings, so they could sell the car to an unsuspecting buyer. The oil pressure looked ample on the gauge but the pump was set up for 100psi to create it. As with any aspect of the engine, it is best not to contemplate the task at hand in one dimension. The key to a successful oiling system is to establish a synergy—consider all the factors that influence oil pressure.